When starting this ambitiously asinine project the goal might’ve been far-fetched but the plan itself was relatively simple – to try and work our way through rock history one record at a time. Not, however, each and every side of all of those records! As of right now rock is seventy years old and still going strong. The objective is to cover that entire history, as many different artists and records as possible. But since it takes time to do that there’ll constantly be more records added for us to review by the time we’re up to the present. Since late January 2017 when Spontaneous Lunacy was launched we’ve reviewed 126 songs, a pretty fair clip if I do say so myself, but in that time there’s been at least that many new rock songs released! In other words we’re not catching up anytime soon. In fact we’re not even cutting into it in the slightest. So if we’re going to start adding more and more B-sides to the roll call of reviews it won’t be long before we fall further and further behind with absolutely no chance of making up ground. While I have every intention of being immortal (don’t laugh, I’m off to a good start…) as of yet I have no concrete plan as to how to achieve this goal of immortality and so at some point 60 or 70 years down the road the sand in the hourglass might run out and by that time I’d like to have gotten around to reviewing the rock of my OWN era that’s coming out as we speak (Jay-Z’s engrossing 4:44 album which just was released and the myriad of songs on it we’ll need to sift through) rather than remaining eternally stuck in my grandparents… or great-grandparents generation of rock! Yet here we are adding another B-side from 1948 to the queue. What gives? Well there’s a couple of reasons actually, only one of which enables you to call me a soft touch for the long forgotten songs of yesteryear. It’s the other reasons though that makes this effort to be more inclusive at this point all the more vital. It’s no secret that the ongoing chronicling of rock history has unfortunately been skewed by those who are a) writing those histories and b) presumed to be reading those histories. In the former many times their efforts are tainted by their own unfounded preconceived notions regarding the origins of rock, and in the latter it’s due to the purported interests of the ones who are most commonly targeted as the market for whatever book, article or documentary that will be shortchanging this history for their tacit approval. In both instances it’s largely a case of conforming to pre-existing – yet erroneous – beliefs brought about by a myriad of somewhat unsettling cultural factors. Putting aside a deeper study of those reasons for a later date, I can’t think of any other form of historical analysis that suffers from this trend, but suffice it to say that’s the reason why most rock timelines only start picking up the story in earnest around the mid-1950’s. Perhaps they’ll mention a handful of earlier sides (often insultingly referring to them as “pre-rock” songs to make matters worse) but then they’ll zealously focus on the post-crossover eras, distorting history beyond recognition in the process by excising the entire start of the story. As stated the intent of this blog was (in part) to correct that injustice by covering ALL of rock equitably. But doing something proactive about it poses a bit of a dilemma. We can’t merely skim over the later years to even up the tallies, yet by the time we get to say 1958 the number of rock artists will have increased exponentially thereby guaranteeing an uneven amount of coverage when compared to 1948. Similarly there’ll be more rock singles released in one week of 1968 than there will be in two or three months from 1948. When we get to 1978, ’88 and ’98 there’ll be more rock sub genres than there are rock records in total for 1948, each with hundreds of releases of their own to be covered. In other words the depth in the field will keep growing. By that time I can leave out most of the B-sides (well, by the 80’s there ARE no B-sides for the most part) without noticing the loss, but at this stage of the game doing so across the board will only serve to a make a thin field even thinner. Rock was still a new form of music in the late forties, its commercial viability was still seen more in terms of potential than evidential. We’ve gotten through an entire year thus far and yet have only covered 50 total artists. Granted there are more showing up all the time now, but it’s still a slow process until the field starts to get really crowded, which means the total number of rock records we have to CHOOSE from when deciding what to review at this point is still somewhat limited. Therefore to ensure the era-related imbalance doesn’t get TOO far out of whack the solution is to take a look at a few more B-sides of the artists we’re encountering along the way, even if by doing so it’ll take a few weeks or months… years??! ?… longer to get around to reviewing the latest release in July 2017 by Vince Staples. Sorry Vince, I like your stuff a lot and I have every intention of getting to it eventually, but trust me when I say the added wait is for a good cause. So in that spirit get ready for The Extended Director’s Cut of Spontaneous Lunacy, coming to a computer, tablet or phone near you! As the lights go down and the feature presentation starts, the credits rolling across the screen tell us we’ll once again be seeing Little Willie Littlefield, just a day after his more definitive statement and fully aware that we’ll be meeting him countless times over the next decade. All of that’s not to say that there aren’t new lessons to be learned from this side of the record. Quite to the contrary in fact. Two features stand out in particular that are well worth getting into, especially since we haven’t closely examined either one thus far on these pages. Unlike the stampeding instrumental on the top side, Little Willie’s Boogie, where Littlefield stakes his claim as a fierce pianist with little regard for life and limb, My Best Wishes showcases Willie the vocalist, something which will be an important facet of his ability to remain relevant in rock as time goes on. Though to date we’ve seen the most excitement in the genre coming from instrumentals, primarily saxophone led celebrations of decadence, the long term commercial limitations of a style that gravitates towards music without lyrics and vocals should be clear to anyone. As long as music has two primary components – the music itself and whatever those involved choose to deliver atop that music with their voices – the risks of sticking exclusively with the former are obvious. People crave variety in what they hear – songs hitting on different moods, emotional needs, perspectives and offering vastly different insights. Instrumentals by their very nature are hampered in that regard. That doesn’t mean what they provide isn’t rewarding but it can be repetitive and limited by nature and those styles which rely primarily on instrumental music generally have a shorter time at the top of the cultural dog pile, especially in a singles-oriented genre. At this stage of the game rock ‘n’ roll was at risk of staking its claim as a genre that was top-heavy with instrumentals and so seeing someone who was about to connect with another one (Little Willie’s Boogie would make some territorial charts, for what it’s worth) but who provided an vocal alternative to the pounding unrelenting noise on the flip side was reassuring from a standpoint of musical diversity if nothing else. More reassuring however, and more notable in a way, is where he clearly drew inspiration from ON those vocals. At first listen, without checking the label, you might think you stumbled onto an Amos Milburn record by mistake. This is quite significant really. We’re starting to see rock artists influencing other rock artists, something that speaks to its immediate impact on the generation coming age. Little Willie Littlefield, turning 17 as this hit the market, certainly qualified in that sense. We saw this first with the other teen sensation, Andrew Tibbs, whose exposure to Roy Brown made a huge impression on the 18 year old, as his style quickly took on shades of his newfound idol. In future years this type of thing will be commonplace as more grow up with rock ‘n’ roll as an omnipresent fact of life and therefore naturally take their cues from it, as anyone hearing Jackie Wilson aping the aforementioned Roy Brown (and Roy Hamilton on ballads) or Mick Jagger doing his best to sound like Don Covay can attest. But at this point, when rock is still trying to assert its value going forward, something like this speaks well of the reach it was already exhibiting. 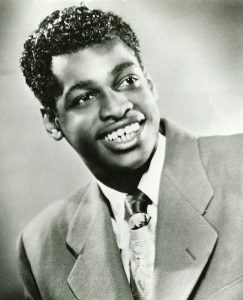 Littlefield’s imitative qualities no doubt was helped by regional factors as well, since both he and Milburn were from Houston and before he moved west and signed his first contract with Aladdin Records two years earlier, Amos was a popular local attraction. Littlefield was already performing in clubs at 14 years old so it’s entirely possible they crossed paths then and it’d be natural for him to pick up on Milburn’s style at a time when, like all impressionable teens, he was still in the process of forming his own style. Of course he’s not quite as polished as Milburn, nor will he ever be, but he’s reasonably effective here in a drawn out confessional approach. The draggy tempo he sings with provides a nice contrast to his more spry piano playing, the two dominant sounds pulling against one another yet somehow not clashing despite their differences, but rather making it sound sleepy and seductive and really quite captivating at times. But we alluded to another reason why including this song was beneficial because it would help show something else about rock itself in this period and that’s the obvious drop in quality of the recording itself, the one aspect where this record is a bit of a let-down. This serves as a prime example of the shoestring budget existence of small record companies with no experience in producing records, no qualified engineers to oversee the recording process and presumably no budget for retakes. As a result My Best Wishes sounds like a demo at times, little more than an early run through. The lyrics at various points could use polishing, words seemingly either forgotten and thus forcing Willie to ad-lib to cover for it, or they’re just not well-crafted to begin with making for some spotty cadences. There’s a semi-spoken section that might’ve worked quite well if it had only been better planned and rehearsed, but instead it sounds as if he’s merely speaking off the top of his head when it comes along, giving it a choppy quality that’s hard to overlook. He never completely loses his way, at least what he comes up with fits the song to a degree, but it’s sloppy in sense, reflecting badly on Littlefield for one, but reflecting worse on Eddie’s Records, revealing theirs was an amateur production from top to bottom. This type of thing wasn’t uncommon at the time of course, particularly since so much of the music was made for similarly novice companies. As we go along in our history these types of shoddy takes will rarely be released as the market becomes more unforgiving, the expectations of all involved (artists, A&R heads, label owners and audiences) are set much higher, and the recording techniques that are used become ever more sophisticated (here it sounds as if they have one, maybe two microphones at most to capture this) as does the playback equipment which simply won’t allow for them to get by with subpar releases such as this. But for now it’s merely one of the unfortunate facts of life a young artist and younger record label have to deal with and while not ruining the final product completely, it definitely drags it down and makes listening a bit of a struggle at times, despite the positives which remain clearly evident in spite of the technical shortcomings. In the end though I’m glad we had a reason – or an excuse – to cover this record in some depth. While unable to heartily recommend as it falls slightly short of being even average thanks to the production missteps, there’s certainly plenty about it to find merit in and absolutely no reason why it can’t be modestly enjoyed on an aesthetic level. As for the historical aspects that allowed it to be included here in the first place, what My Best Wishes does show with increasing clarity is that far from being a series of insular events, unconnected to one another and owing more to happenstance than a concerted effort on anyone’s part, rock ‘n’ roll was indeed consciously being made by those who had a definite aim in mind all along, musically and otherwise. That they might not yet always achieve those goals when setting out is nothing to hold against it, for even years later when rock had risen to the highest plateaus imaginable it still wasn’t any more consistent from record to record in meeting everybody’s highest expectations… as we’ll find out down the road… whenever we finally get there. 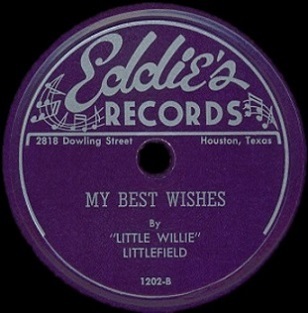 Leave a reply on "Little Willie Littlefield: “My Best Wishes”"